The Mayor of Cockermouth, Councillor David Malloy. The Mayor of Cockermouth, Councillor David Malloy who is an elected councillor from the All Saints Ward as an Independent candidate. I am a married father of three grown up children and my wife Lynn will be acting as my Mayoress for the upcoming year. 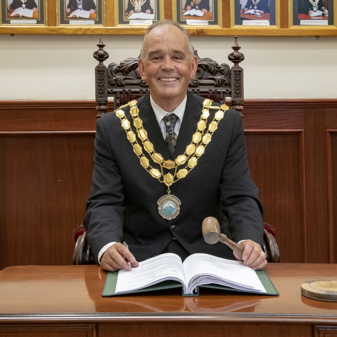 Born and raised in Cockermouth I am very proud to be elected as mayor of Cockermouth with the knowledge that I know at least five generations of my family have lived here. I currently work for United Utilities where I have been for the last 30 years and before that I worked at Strawberry How Farm just after I left school. Outside of my family I am an active member of Cockermouth and Loweswater agricultural shows and I also sit on the Advisory committee for Greysouthen Young Farmer Club. My chosen charities for the upcoming year are Brain Tumour research and the McMillan nurses. The Mayor will be holding a surgery in Cockermouth Library, 88 Main Street on Saturday 30th June from 10.00am to 12 noon. No appointment required. If you would like the Mayor and Mayoress of Cockermouth to attend your event please complete and return the attached form.